Most internationally recognized vocaloid artist on “Nico Nico Douga”. The total number of plays that all related videos on internet video sites have surpassed 7 million. The songs “Sweet Devil” and “Electric Love” which were created in collaboration with MMD producer Wakamura P are Hachioji P’s most renowned songs. They boat high-quality promotional videos with an electronic sound with a strong dance music base; popularity of these videos expelled Hachioji P’s status to an instant hall of famer. Hachioji P’s first major album release on February 1st, 2012, hit 11th place on the Oricon rankings on its first week. Hachioji P’s popularity has spread outside of Japan, and the song “Sweet Devil” released in Taiwan marked 4th place on the K-POP/J-POP rankings. A subsequent release “Electric Love” marked 3rd on the K-POP/J-POP rankings and 8th on the overall rankings. 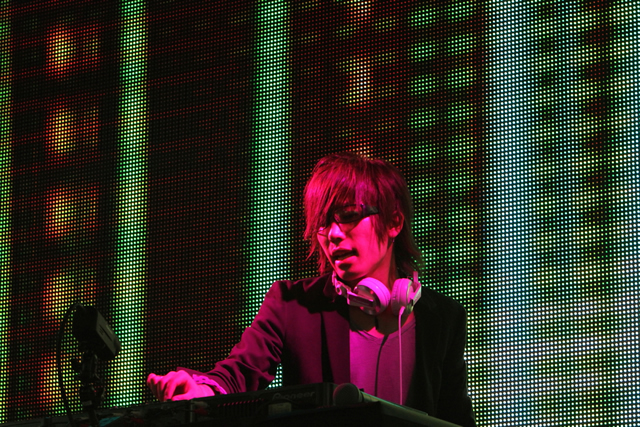 Hachioji P, on top of his vocaloid projects, actively performs as a DJ, which has also acquired him wide recognition. His activity as a DJ has given him the firm base to which allows him to masterfully blend dance music with groovy electronic sounds and vocaloids to create a one-and-only unique sound. ※MMD is the acronym for “MikuMikuDance”, a freeware designed to create animations using manipulation of 3D character models.